As the kids get out of school, and people begin to plan their summer road trips, more and more pets are brought out on the road with their owners, and at one point or another left in a hot car. It is an unfortunate belief that leaving the windows cracked and a dish of water in the car will keep the animals safe. Most people don’t realize that even when the outdoor temperature is only 80 degrees Fahrenheit, the inside of a parked vehicle can heat up to a staggering 114 degrees within 30 minutes. What’s worse, is animals cannot cool themselves and help regulate their body temperature like humans and can easily overheat. Once an animal overheats, it can cause serious organ damage or even death. For this reason, leaving an animal alone in a car is not only a bad idea, but could be considered animal cruelty as well. Recently, a Phoenix woman was arrested after her dog died after being left in a car for nearly five hours. She assumed the dog would be fine because she left her car running with the A/C on and the windows cracked and a small dish of water for the dog. But, unfortunately even these measures weren’t enough to protect the dog when the outdoor temperature reached over 90 degrees. According to the Animal Legal & Historical Center at the Michigan State University College of Law, there are currently 19 states that have statutes that specifically prohibit leaving an animal in a confined vehicle. Arizona is one of them. The law here states that having any animal (mammal, bird, reptile or amphibian) unattended and confined in a motor vehicle and physical injury to or death of the animal is likely to result could be classified as a class 1 misdemeanor. The law states that a peace officer, animal control enforcement agent or animal control enforcement deputy may use reasonable force to open a vehicle to rescue an animal. Take down the car’s make, model and license-plate number. If there are businesses nearby, notify their managers or security guards and ask them to make an announcement to find the car’s owner. If the owner can’t be found, call the non-emergency number of the local police or animal control and wait by the car for them to arrive. If the animal appears to be in immediate danger, call 911 and follow their directions. Depending on where you are and the circumstances, they may talk you through breaking the animal out of the car. Get informed: Learn your town’s laws about leaving pets in hot cars. Be ready to call for help: Gather essential telephone numbers and have them on hand. You’ll want to have your local animal control agency’s number and the police department’s non-emergency number so you can quickly report the situation. Keep these numbers in your purse, your car’s glove compartment or programmed into your phone. 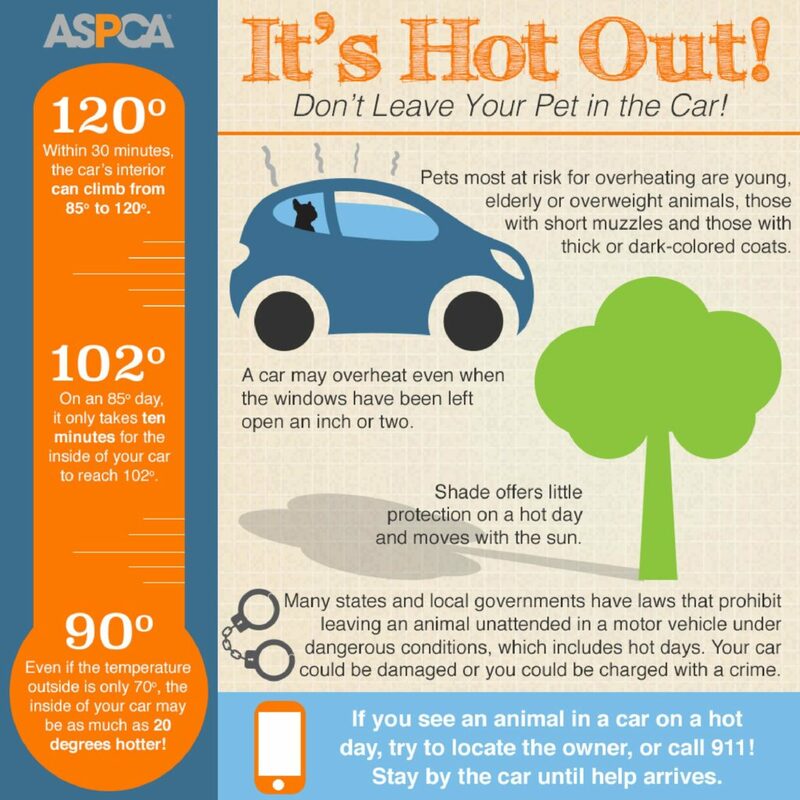 Spread the word: Distribute The Humane Society of the United States hot car flyer, which spells out the dangers of leaving pets in parked cars. Order more flyers on animalsheltering.org. You can also watch and share the retro video on the issue. Get involved: Ask local store managers, shopping malls, restaurants and other businesses to post signs asking customers not to leave their pets in their cars while shopping or dining. 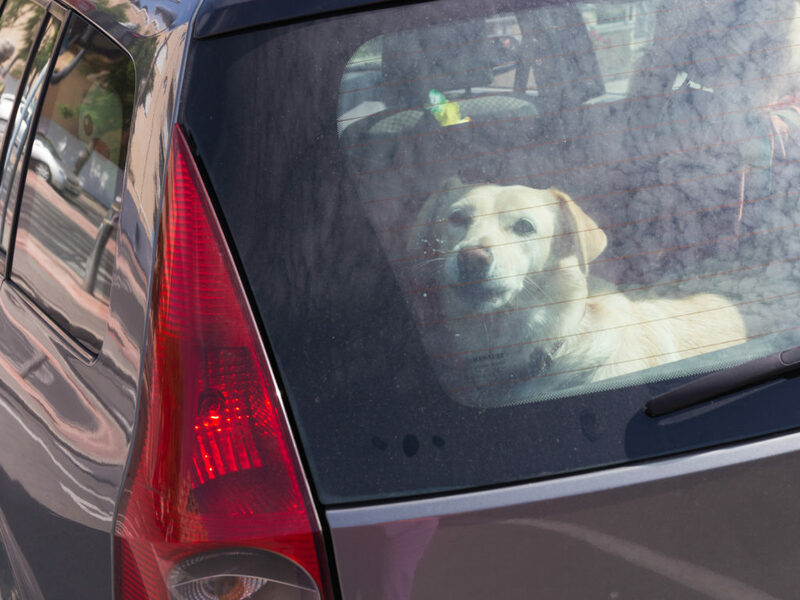 Speak up: If your town doesn’t have a law prohibiting leaving pets in parked cars, contact your local representatives or attend a town hall meeting to start lobbying for one. Learn the basics about advocating for animals with the Humane Society’s activist toolkit. When it’s 72 degrees Fahrenheit outside, the temperature inside your car can heat up to 116 degrees Fahrenheit within an hour. When it’s 80 degrees Fahrenheit outside, the temperature inside your car can heat up to 99 degrees Fahrenheit within 10 minutes. Rolling down the windows has been shown to have little effect on the temperature inside a car. The safest place for your pet would be at home, but if you must take your pet somewhere with you, please make sure that you will not be leaving it in your vehicle unattended at any point in time.